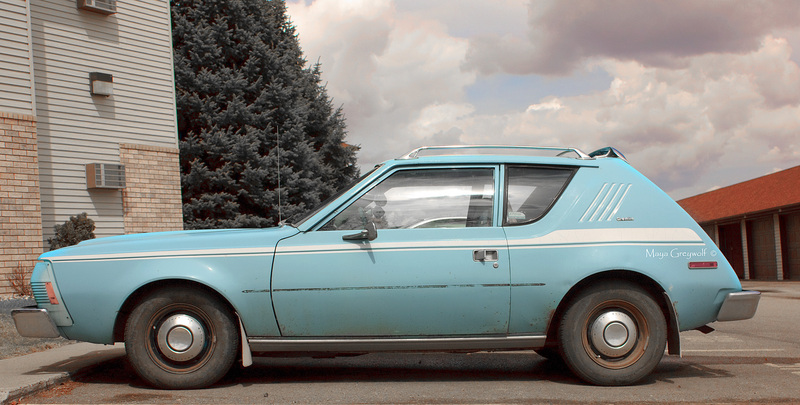 My confession…A Mellow Yellow Gremlin was my very first car. This photo takes me back a few years. Isn’t THAT the truth Cee! Oh probably…sigh, lol. I found this car a couple of years ago (in North Dakota) – before that, I hadn’t seen one in many, many years! It’s always the way… my Mum and Aunt have often told me of items of clothing they used to wear in the 60s and 70s… some of it sounds like it would be perfect for today’s fashion but they didn’t keep any of it, which pains me. But you can’t hold on to everything! 😆 We shouldn’t laugh really. This was once someone’s pride and joy. LOL! Came for a visit after I posted. What is it about cars that we seem to have have even a small emotional investment in them? Must be all the great things/bad things they remind us of? I had a bright yellow VW Super Beetle. Loved that car! What a kick in the head eh? Yes! I thought those were gone. That is one fabulous car and I just love the color! I know, isn’t the color fabulous??? I do love the photo and colors though! OMG a GREMLIN?!?!?! And you even admit to having had one 😊 . I used to get rides home with an upperclassman in college. 9 hours each way in his red Gremlin. Haven’t thought about it in years. Kind of like riding in the back seat of a tin can with a bunch of other sardines driving at 70 mph on the Pennsylvania Tpk in the snow. Amazing I lived to tell the story!!! You’re a lucky woman to have survived snow travel in a Gremlin, I grew up in the Midwest and visited more ditches than I care to count in mine. OMG how kewl I had one with a 287 an a 4 speed was an awesome toy! Ooh nice, the blue car stands out so well against its background. Oh my, six of one, half dozen of the other – lol. I think you’re the only person who came up with a photo of something just as soon forgotten! Very creative.